There have been 20 coaches paid, professional coaches in the history of the Baker University track and field program. Prior to 1907, George W. White served as the team’s manager. White was a student at the time and also competed on the team from 1904-1906. The records are unclear about both coaches and team finishes prior to 1904. Below are brief biographies of each Baker University track and field coach. Scherer was brought a great deal of experience to the position of Athletic Director and coach at Baker University in 1911. Before hie arrived at Baker, Scherer was the Physical Director at the Nebraska State Normal School at Peru, NE. In addition to this experience he brought with him an impressive athletic pedigree as multiple letter win and graduate of the University of Chicago in 1904. He was mentored at Chicago by legendary coach Amos Alonzo Stagg. Following his time at Baker, Scherer made his way west and coached for many years as Pasadena High School in California. Gallagher became the Baker University Athletic Director after serving an assistant coach at Oklahoma A&M, his alma mater. The 1913 Oklahoma A&M notes that he received “a much larger salary” at Baker. As an athletes Gallagher was all-state football player and held the Oklahoma state records in 100 and 220 yard dashes as well as the 220 yard low hurdles. In the fall of 1915, Gallagher returned to Oklahoma A&M as athletic director and wrestling coach. He remained in this position until his retirement in 1940. During that time he amassed 11 NCAA championships and oversaw 19 undefeated seasons. Schlademan served as track coach and athletic director during his short stint at Baker University. He previously coached at Missouri Wesleyan, Depaul University, and the University of Arizona. Baker won the KCAC in 1919 under his guidance before he moved on to the University of Kansas. At KU, Schlademan was responsible for coaching the Jayhawk’s first All-American and National Champion and an eventual Olympian, high jumper Tom Poor. He was also instrumental in helping found the annual of Kansas (KU) Relays. Following Kansas, Schlademan coached at Washington State and Michigan State. During his career he won 11 national championships as well as numerous conference titles. He was posthumously inducted into the Drake Relays Hall of Fame, the Michigan State Athletic Hall of Fame, the Washington State Athletic Hall of Fame, and United State Track and Field and Cross Country Coaches Association Hall of Fame. Clarridge graduated from Baker University in 1916 after studying at Oklahoma A&M where he competed in track. Bretnall was the most successful and longest tenured track and field coach in Baker University history. As an athlete he was captain of the Cornell College track and field teams and member of the 1920 U.S. Olympic 4x4oom relay team. Bretnall was hired away from Baker in 1937 by Iowa State University. He was inducted in the Baker University Athletic Hall of Fame, the Cornell College Sports Hall of Fame, and the Iowa Track Hall of Fame. 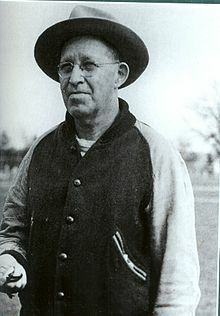 Ridgway was appointed football and track coach in December of 1937 following Bretnall’s departure and Liston’s resignation as football coach to focus on his duties as Athletic Director and NAIB chairman. He previously coached at Leavenworth High School and Emporia Teachers School while a graduate student. Ridgway resigned in February of 1940 after 2 years leading both teams to take a job with a chemical concern. Liston was a 1913 Baker University graduate and all-around athlete. He briefly played professional baseball and briefly served as the football coach at Wesleyan University in Middletown, CT. He returned to Baker University in 1920 as Athletic Director, football, and basketball coach. He took over for the track and field program after C. W. Ridgway resigned in February 1940. Liston was assisted by Don Snyder, who, according newspaper reports, played a large role in guiding the track program. Liston is considered the Father of the NAIA because he co-founded it’s forerunner NAIB in937 with James Naismith, which is considered the oldest college basketball tournament. He served as its first executive secretary following his retirement from Baker in 1946. Liston died in 1949, but was posthumously inducted into the Naismith Memorial Basketball Hall of Fame, the Baker University Athletic Hall of Fame, the Kansas and Missouri Sports Halls of Fame, the Helms Athletic Foundation Hall of Fame, and the NAIA Hall of Fame. 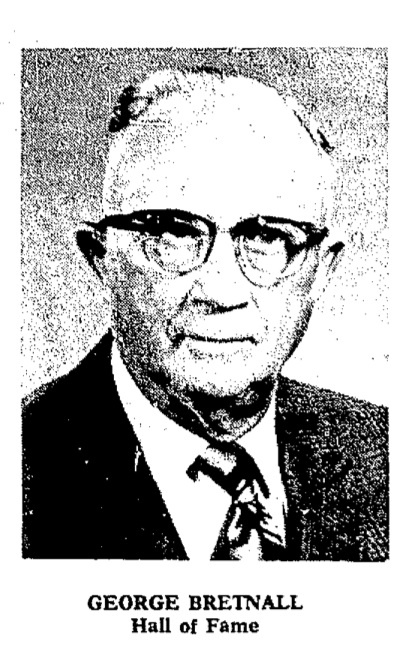 Spear, a 1933 Baker University graduate, took over as Athletic Director when Emil Liston retired. As became the custom for Baker coaches, he oversaw all-sports. During his tenure he was assisted by Russ Davee and James S. Irick while coaching football, golf and track. As track coach Spear took two BakerUniversity athletes to the first NAIA track and field national championships in 1952. The following year, he coached Palmer Mai to the school’s first national championships. Spear’s legacy, however, is more commonly associated with the football and golf teams. He coached the golf teams until his death in 1981 winning over 17 conference championships and taking 10 teams to nationals. Spear remained athletic director until 1973 but turned the football and track programs over to his top assistant James S. Irick in 1963. He also served as the first president of the Heart of America Athletic Conference. Spear was a member of the inaugural class of the Baker University Athletic Hall of Fame. Irick, a 1948 Baker University graduate, took over for Karl Spear as football and track coach in 1963. He was not new the program, however, serving as head basketball coach and assistant coach for track and field under Karl Spear since 1958. He added the role of tennis coach in 1974 and remained in that role until his death in 1993. Irick excelled as tennis coach, guiding his teams to 13 conference championships and 10 NAIA tournaments. Irick was also the Baker Athletic Director from 1973-1991. It was undoubtedly difficult for Irick to juggle these responsibility. He stepped down as track coach in 1973 and football coach in 1975. Irick was inducted in the Baker University Athletic Hall of Fame in 1982, and the NAIA Hall of Fame in 1991. A 1961 Baker University graduate, Mansfield joined the Athletic Department in 1966 as an assistant football coach. During his nine years as a Baker Coach he served as head baseball coach for two season and head basketball coach for nine seasons. Mansfield’s stint as head track and field coach was brief as dwindling student interest and Title IX contributed to the programs dissolution. Smith was a member of the 1974 and 1975 track teams and 1977 Baker graduate. He was working on a Master’s degree in physical education at the University of Kansas while serving as temporary coach for the 1979 season. Jones was hired to be the head men’s and women’s track coach for the 1980 season. Oddly, his hiring was reported at the same time as his predecessor’s. Prior to Baker University, Jones was head football and track coach at Snowflake High School in Arizona. He was all the starting quarterback at Brigham Young University in the late 1970s. 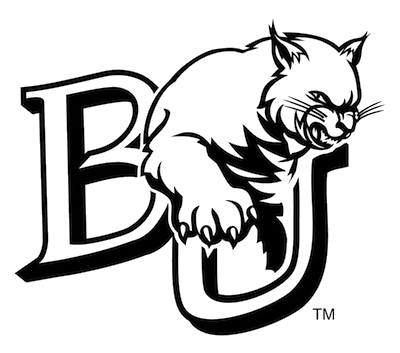 In addition to coaching track and field, Jones was also the offensive coordinator for the Baker football team and a graduate student at the University of Kansas completing a Master’s degree in education. Kynion was announced as the head coach of the Baker University track and field program on June 25, 1980. He was previously an assistant football and wrestling coaching at Kansas City Center High School and before that has coached football and track at Central Missouri State. He also served as the Baker football team’s defensive coordinator while coaching track. Legendary football Coach added stability to the Baker University track and field program from 1982-1985. He came to Baker in 1980 as football coach after serving as a football and track coach and administrator at the junior college and high school level. Richard continued to coach football until his death in 1995 (with the exception of the 1991 season). He became Athletic Director in July 1991 and was instrumental and restarting the Baker Relays in 1993. Richard is a member of the Baker University Athletic Hall of Fame, the Kansas Sport Hall of Fame, and the College Football Hall of Fame. Weber was named head men’s and women’s track and cross country coach on July 2, 1987 combining the two sports under one coach for the first time. Prior to Baker, Weber was a graduate assistant coach at Emporia State University, and before that a head track coach at the high school level. Following his time at Baker, Weber became the head men’s and women’s track and cross country coach at Fort Hays State University. He still holds this position. Candrl, an assistant coach at Ashland University and former high school coach, took the reigns of the Baker University track and field program in the summer of 1996. Prior to that he was an all-American decathlete at Northeast Missouri State University (Truman State). Candrl’s athletes rewrote the Baker record books as he led the teams to national prominence. He won three conference and two regional Coach of the Year honors for his efforts. This success led Candrl to move on to the University of Missouri as an assistant coach. 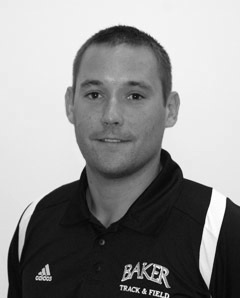 A New Zealand native and graduate assistant under Candrl at Baker, Mallinder took over the program in August of 2000. He was also a teammate of Candrl while running the 400m at Northeast Missouri State University. Under his watch the program’s number of all-Americans doubled. Mallinder resigned as coach in 2007 to return to New Zealand. Kindler came to Baker University after serving three years Kansas Wesleyan University in the same position. Previous to Kansas Wesleyan, he was an assistant coach at Fort Hays State University under former Baker coach Dennis Weber. Kindler was also a student-athlete at Fort Hays, where he was a four-time All-American and a national champion in the javelin. During his time at Baker, Kindler has won HAAC Coach of the Year honors 10 times. His men and women athletes have combined for 16 top three finishes and 22 all-Americans performances at the NAIA national meet.